Showing His Stripes: Now that he’s a U.S. citizen, this month Wahid (with the author) will vote in a general election for the first time—in any country. I met Wahid in Afghanistan, where he helped me navigate a strange, war-torn landscape. Then he came to Dallas, and it was my turn. We have known each other since 2001, when Wahid was living in Afghanistan, where daily dangers far outweighed the heartbreak of dry waffles. But now he has lived in Dallas for 14 years. He aced his engineering classes here so quickly that he simultaneously earned his bachelor’s and master’s degrees at SMU, a campus that will always be known in our house as Southern Muslim University. Wahid went on to get his professional engineer’s license, found a good job, and came to love the Lone Star State—a place on the opposite side of the world from where he was born. Not long ago, Wahid became a U.S. citizen. This will be his first experience voting in a general election—in any country—and he’s obsessed with political news. We had to delay our Sunday brunch so that he could finish watching Meet the Press, This Week, and Face the Nation. Wahid was funny and smart and a quick study. He would be with us every day on multiple trips to Afghanistan. We came to count on him, value his judgment, and treasure his friendship. Today, as we sit in the cafe, laughing over our chicken and waffles, arguing about whether mango juice is better than orange juice, and shaking our heads at our crazy presidential contest, it’s amazing to think how far we’ve come together. My small team from CBS News had been traveling for almost 36 hours by the time we reached Bagram Air Base, in Afghanistan. Our flight corkscrewed in at high speed to avoid artillery fire. My friend and colleague Dan Rather sat beside me, trying to soothe me with stories about his Texas childhood. It didn’t work. Our little plane landed on a bombed-out runway that was littered with the charred skeletons of Russian fighter jets. It was early on in our country’s seemingly endless “War on Terror.” Back home, what was left of New York City’s World Trade Center towers was still smoldering. U.S. troops arrived at the same time we did, set on dismantling the Taliban and upending Al Qaeda. We were hot on their heels. Tired and disoriented from our trip, we were met by a group of Northern Alliance fighters—compact, serious men carrying assault rifles and bristling with ammunition belts. There was no customs office to go through. We were just told to hand over our passports. One man signed mine with a flourish and grimly handed it back to me, then flashed a shy smile. We loaded our gear into two beaten-up vans and headed for downtown Kabul, 50 miles away. The moment we crossed through the gates of the guarded air base, a young Afghan man began running beside the van, pounding on the window next to my face. Our driver told me the man was registering his disapproval at my lack of a head covering. Bumping along a battered stretch of gravel road into the city, we passed overturned tanks and deserted military equipment. 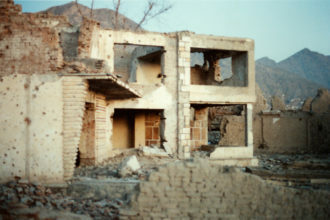 The bone-dry, dirt-colored prairie had once been a thriving landscape of lush vineyards, until the Taliban moved in and destroyed the irrigation system to punish locals for resisting their radical rule. The vineyards dried into dust, and the farming families fled. Years of fighting took everything else. I pushed my side window open, hoping to get some fresh air. Instead, fine dust floated in, coating the inside of our windows almost as heavily as the outside. Peering through the haze, I saw what looked like small piles of discarded blue fabric along the roadside. As we approached, the material moved. Thin arms emerged from the folds of cloth, hands cupped. Our driver explained that these were “war widows,” women who had lost their husbands, brothers, and sons. The only way for them to survive was to beg. They called out “Baksheesh!” as we bumped past, asking us to throw money at them. When we reached Kabul, it was a tangle of cars, ox-drawn carts, bikes, and blue burqas. Raggedly dressed men wielding what looked like witches’ brooms ceaselessly swept the dirt near storefronts, only to have more dirt blow in. We drove past block after block of homes and businesses devastated by bombs. Heavy stone structures had collapsed and fallen into each other, jumbled like building blocks kicked over by giants. We were headed for the Intercontinental Hotel, which sat high on a hill overlooking the broken city. Once a magnet for tourists, its glory days were long gone. Now just a shell of the building remained, a collection of rundown rooms with no running water and no electricity. At the dingy front desk, an apologetic innkeeper handed us room keys and buckets. The buckets were our bathrooms. We trudged up six flights of stairs in darkness. At just over 6,000 feet above sea level, Kabul’s thin air had us gasping. We all wheezed, trying to pull in a full breath without swallowing dust and wood smoke. Upstairs, a few CBS staffers were already in place, including the network’s ace technical folks, who seemed able to get a television signal out from anywhere in the world, even under the worst conditions. After hugging the people we knew from previous wars, we were handed our marching orders. Because of the time difference, we had to start gathering material that instant and get it back to New York as soon as we could, no matter how tired we were. Standing by to help were several fixers, young Afghan men hired to arrange interviews, get us where we needed to be, and teach us basic culture and courtesy. They would translate every conversation and keep us alive despite our lack of local social skills. One of our new hires appeared unable to speak any English at all. He could understand what we were saying but responded only with hand signals and exaggerated facial expressions. Another had spent years studying a 1920s Dari-to-English dictionary and peppered all his conversations with phrases like “shake a leg,” “cut a rug,” and “the bee’s knees.” He wouldn’t ask if we were ready to leave; he asked if we wanted to skedaddle. Some of his references were so obscure that we had to borrow his dictionary to see what the hell he was talking about. It was adorable but time-consuming. And then there was Wahid, a smiling 22-year-old with a scruffy beard. He wore traditional Afghan attire, sort of a knee-length dress shirt with matching pants and sandals. Wahid had worked with Westerners before. His English was excellent. Even better, he had a ready laugh. I grabbed Wahid to come along with us for an interview Dan and I had to do with Abdullah Abdullah, a Kabul politician who was planning to run for the presidency now that the Taliban had headed for the hills. Dan and I were so tired that we were beyond punchy. As we waited for our camera gear to get set up, I, ever the professional, fell sound asleep in my chair. I jolted awake when I heard Dan greeting our interview subject—calling him Mohammed. Knowing how tired Dan was, I leaned over and whispered the correct name in his ear. He nodded and acknowledged what I was saying, but as I backed away I heard Dan call him the wrong name again. Then he called him Mohammed Abdullah. Abdullah stared at us incredulously. I put my head in my hands. Then I heard Dan address him as Mr. President, quite a promotion. I cringed. Behind me, I heard barely suppressed laughter. It was Wahid, struggling to keep from cracking up. He was biting his lip, pinching himself, turning away, shaking his head, doing anything he could to stop the laughing fit that was about to ruin his first day on the job with us. 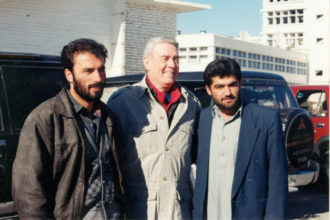 Wahid served as the translator for Mapes and Dan Rather in Afghanistan. They first met in bombed-out Kabul in 2001; on the CBS News crew’s last day there, they asked Wahid if he wanted them to try to bring him to America. My lack of sleep got the best of me, and I burst out laughing—totally inappropriate, but unavoidable. When I told Dan what he’d done, he doubled over, too, laughing harder than anyone at his fatigue-driven performance. Wahid guffawed, relieved that we had a sense of humor. Abdullah Abdullah thought it was funny, too. He knew what it was like to work through utter exhaustion. After snorting and staggering around for a few minutes, we all composed ourselves and started the interview again. Right then, I knew we’d found the perfect person to work with us. Wahid was funny and smart and a quick study. He would be with us every day on multiple trips to Afghanistan. We came to count on him, value his judgment, and treasure his friendship. Getting him to Dallas was not easy. It required filling out countless forms, and signing written contracts of support and responsibility, along with making dozens of phone calls to the American embassy in Pakistan. We contacted SMU, and the school generously offered a half scholarship based on Wahid’s grades from school in Kabul. We tried to soothe his family’s fears. His mother, who had watched too many old westerns, was particularly worried about all the guns in Texas. He was stunned when a restaurant hostess handed our little boy a coloring book and crayons before taking us to our table. “My God, Americans have thought of everything,” he said. He had also expected America to be covered with skyscrapers, from coast to coast. He was happy to find that Dallas was more down-to-earth. But everything about life here was foreign to him. The plants and trees were unfamiliar, the air felt heavy and thick, and the rumble of thunderstorms sounded like artillery fire to him. He had to adapt to the constant hum of air conditioning and our oddly designed furniture. After watching my husband and me go back and forth every week about whose turn it was to mow the yard, Wahid took over what must have seemed to him a senseless task. He marveled constantly about the ease and comfort, the organization and security that people here take for granted. He was stunned when a restaurant hostess handed our little boy a coloring book and crayons before taking us to our table. “My God, Americans have thought of everything,” he said. Our near-worship of dogs was another revelation for him. Every day, carefully groomed canines marched up and down our street, led by proud owners who waited patiently as their little friends did their business—and then cleaned up after them and carried the crap away in little plastic bags. This would be beyond unimaginable in Afghanistan, where dogs are considered unclean. Worse still, we had dogs living inside our house. Sadly for Wahid, they loved him on sight and competed for his attention, rubbing up against him and begging for snacks. He was kind and patient with them, just as he was with our curious 5-year-old son, who spied on him relentlessly when his bedroom door was ajar. None of our food tasted like anything he had grown up with, and some of it was downright scary. He found the seafood I loved repellent. When Wahid was served crab legs, he recoiled, as if he’d been handed a bib and a giant orange spider. Eager to show him all that was available in Dallas during his first days here, and to seek out more familiar flavors, I took him shopping at Central Market. When I led him into the store, though, things didn’t go quite as I’d hoped. There was a live band playing. The cases of prepared food, beautiful cakes, fresh produce and fruit, flowers and candles and birthday cards and barbecue supplies, this glittering space packed with throngs of people pushing overflowing carts while pounding music blared—all of it, all at once, was overwhelming. By the time we reached the bakery, he was dizzy. He leaned against a gleaming glass display of cookies and cupcakes, tarts and tortes, and closed his eyes. He was reeling from jet lag, lack of sleep, unfamiliar surroundings, and overstimulation. We tried to help him absorb the culture shock, but everywhere he turned, he saw something inexplicable. Not long after he got here, he stumbled across The Jerry Springer Show, a particularly tacky episode in which DNA tests were being conducted on four men. Jerry was trying to figure out which fellow had fathered the child of a woman who sat in the middle of the group, grinning mindlessly. Wahid called me into the room to ask what on earth was going on. “In Afghanistan, there is a saying, ‘Where do I take my shame?’ It seemed like here,” he says, “people took their shame and shared it on TV. It was just way past my understanding.” Mine, too. Teaching Wahid to navigate Dallas roads probably put me in more danger than I faced during our time together in Afghanistan. He viewed stop signs and lights as suggestions that he sailed past if he saw no cars approaching. Now, one fender bender and too many tickets later, he’s doing better. I hope. One night, he came home after a date and asked my husband and me what would happen if he kissed a girl and her family found out. Would they come after him? He was half-joking, but he was very serious about trying to find his way in a world that seemed to have few rules. Through the years, Wahid remained worried about what was going on in Afghanistan. 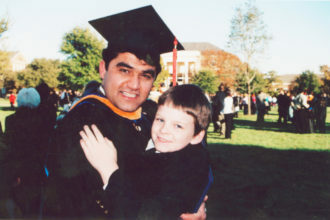 After graduating from SMU, he believed the best way to help was to return and work with U.S. soldiers as a translator and cultural emissary, helping each side understand the other, doing what he could to save the lives of American soldiers and the innocent Afghan civilians caught in the fighting. He returned to Afghanistan in 2010 as a contractor attached to American units in some of the most dangerous places in the country. They regularly worked in the deadly stretch of mountains along the Pakistan border where Taliban leaders were in hiding. His company’s mission was to track down and capture or kill HVTs, high-value targets. Wahid applied for citizenship while he was working in Afghanistan. In 2012, he returned to North Texas and was sworn in at a group ceremony in Irving, joining dozens of other future citizens and their beaming friends and family. The room was alive with languages from all over the globe, with relieved laughter, with faces that could only come together—and belong together—in this country. In front of us was an older man from Ethiopia, next to me an excited woman from Vietnam, behind us a couple from Nigeria who hugged and smiled and waved at their friends. An immigration officer read aloud the list of countries represented in the room as individuals stood to honor their beginnings. There was only one Afghan. They were all asked to raise their right hands, and in an instant they became something else: Americans. My husband and I were teary. Wahid made a beeline to register to vote at a table set up in the back of the room. We all rolled our eyes as one of his American friends asked a new citizen for a date. Then, two days later, Wahid flew back to the other side of the world to return to his work. It was a dangerous decision. Any Afghan working with the U.S. military risked being targeted by the Taliban. Wahid had not entirely leveled with us, his American family, about the dangers he was routinely facing. True to form, he didn’t want us to worry. Sometimes, in the safety and comfort of his Dallas home, he still dreams of the dark nights he spent with U.S. soldiers, walking through Afghanistan’s desolate mountains. Dwarfed by the terrain, lit by a sea of stars, they were always headed for what could either be a mundane encounter or a bloody confrontation, with lives depending on how well Wahid chose his words, how he was able to talk across cultures. He will have to translate again when his mother and sister get here. He plans to show them the mosque in Richardson, take them to picnic at White Rock Lake and to listen to music in Klyde Warren Park. He’s eager to see their expressions as they ride the elevator to the top of Reunion Tower and taste their first corny dogs. He wants his mother to see the beautiful SMU campus and visit some of the buildings he has designed around Dallas. He wants to laugh with them as they discover the delights of the city, the way we did when Wahid first got here. Their visit, that chance to welcome his family to his new world, will complete the circle for Wahid. He could have lost his life in the war. He could have lost his way in the transition across cultures. Instead, Wahid found his future in translation.